The Spanwell extendable Telescopic Pole with hook, expands out to 8 feet. This removes the need for a ladder when hanging S hooks on work sites or manufacturing floors. Thus eliminating falls from ladders that can cause injuries ranging from sprains to deaths. 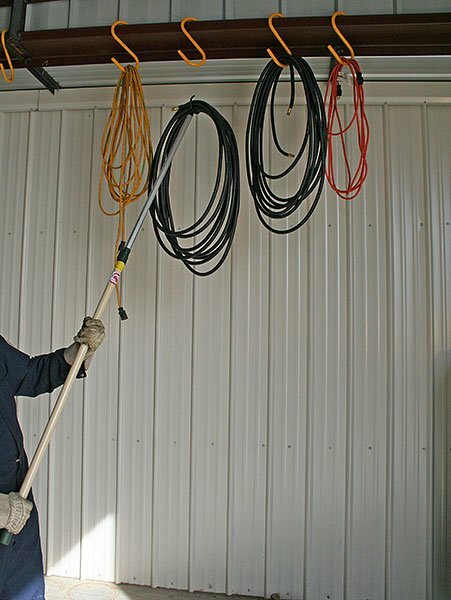 The Telescopic Pole also makes loading giant S Hooks with electric cords, welding lead and air hose safe and easy while keeping workers safely on the ground. Place the top of the large plastic S hook (PVC coated solid aluminum S hooks) into the “C” shaped end of the pole. Lift the S hook up, into the air with the pole and set it upon a pipe. Next, place your electric cords into the “C” shaped end of the pole. Lift the cords up in the air and load them into the lower, hose hanging bottom of the giant S hook. Repeat the same steps to string along air hoses, welding lead, cables and cords. Hanging S Hooks this way is easy and takes much less time than re-arranging and stepping up and down a portable ladder. You’ve now quickly and very safely, without the use of a ladder, organized your work area while preventing a fall injury. The Spanwell extendable Telescopic Pole keeps workers safely on the ground – a safety program checklist winner! You can buy the Telescopic Pole directly from our online store. Learn more about Spanwell’s Hang-It Clamps and industrial S Hooks for hanging hose, electric wire and cords on our Extra Large S Hooks page.